We are located in the picturesque Town of Lake Cowichan. Our fully equipped Guest Cottage is on the main property by a grove of Douglas fir trees. Easy walking distance to town! Approximately 1 km from grocery store, BC liquor, pub and restaurants. The closest water access is less than a 1 km scenic walk to the train trestle and less than 1/2 km to the Little Beach tubing exit! The Guest Cottage has a private yard and carport and is located within the gated entrance to the main property. The bedroom has a queen bed, fresh pillows, fresh linens and a duvet. The kitchen is complete with a microwave, fridge, stove, dehumidifier, coffee maker, toaster, kettle, dishes, pots and pans and cutlery. The living room has a 32" smart television with complimentary Wi-Fi, Netflix and YouTube. There is a private bathroom with shower, comfy towels, soap, shampoo and conditioner. The cottage is winterized and heated with ceramic wall mounted units in the bedroom and living room. There is an outside patio table, propane barbecue and a mega propane fire-bowl which can be used during most outside wood burning fire bans! Cottage games are available for your inside and outside enjoyment. Availability is limited to 2 guests only! No pets! No children! No exceptions! No refunds due to non-compliance! There is a private bathroom with shower, comfy towels, soap, shampoo and conditioner. Located in the beautiful Town of Lake Cowichan! Bath, Kitchen and Beach Towels are provided! Complimentary bottle water and cream. A 32" smart television with complimentary Netflix and YouTube is included! The Cottage has a private yard, patio table, chairs, propane BBQ and mega propane fire-bowl! Limited to 2 guests only! No pets! No exceptions! No refunds due to non-compliance! Great place and get people. Perfect for what we needed - a quiet get away from the rain and cold. Loved our stay at this cabin. Very clean and really enjoyed the extras like coffee, cream for your coffee, even condiments if you want to barbecue a hot dog or something on the propane barbecue provided. Enjoyed a Netflix (included) movie with my husband as well. Would stay again for sure. The cottage was exactly as described. It was so clean and well set up, we wished we could have stayed longer! Had a great stay, this place is a gem. Well maintained and very clean property. This property is very clean and well stocked with great facilities - lovely outside sitting & dining area with gas BBQ & gas fire pit. Easy walking distance from Cowihan town and beside Cowichan River. Excellent and safe parking at property. Great location for the fishing enthusiast. We were very happy with the cottage. It was all it proclaimed to be in the ad and even more. Wonderful property - very clean and comfortable. The kitchen also included lots of condiments which was a really nice surprise. The owners were very respectful of our privacy and when we did run out of propane, all we had to do was ask and the bottle was replaced immediately. Lovely location!! Would highly recommend it to others. 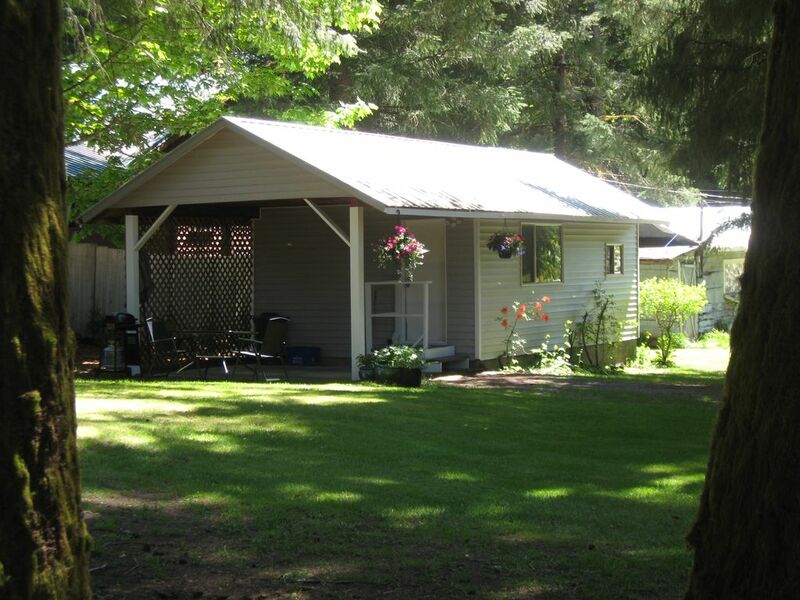 The fully equipped Guest Cottage is located by a grove of Douglas fir trees. It has its own yard, carport and is located within the gated entrance to our property. The bedroom has a very comfortable queen bed, fresh pillows, fresh linens and a duvet. The kitchen is complete with a microwave, fridge, stove, coffee maker, toaster, kettle, dishes, pots and pans and cutlery. The living room has a 32" smart television with complimentary Wi-Fi, Netflix and YouTube. There is a private bathroom with shower, comfy towels, soap, shampoo and conditioner. There is an outside patio table, propane barbecue and a mega propane fire-bowl which can be used during fire bans! Cottage games are available for your inside and outside enjoyment. We are located in the mountains in the picturesque Town of Lake Cowichan. The Guest Cottage is located next to a mature grove of Douglas fir trees. You are within walking distance to restaurants, a grocery store, liquor stores, Cowichan Lake, bus stops and other central amenities. The closest water access is less than a 1 km scenic walk to the train trestle and less than 1/2 km to the Little Beach tubing exit!